The bond between man and dog is a pretty serious one, and people have gone to all sorts of ends to do nice things for their canine companions. But YouTuber penguinz0 is making the rest of us look bad with this immense ball pit that he made for his loyal pet. 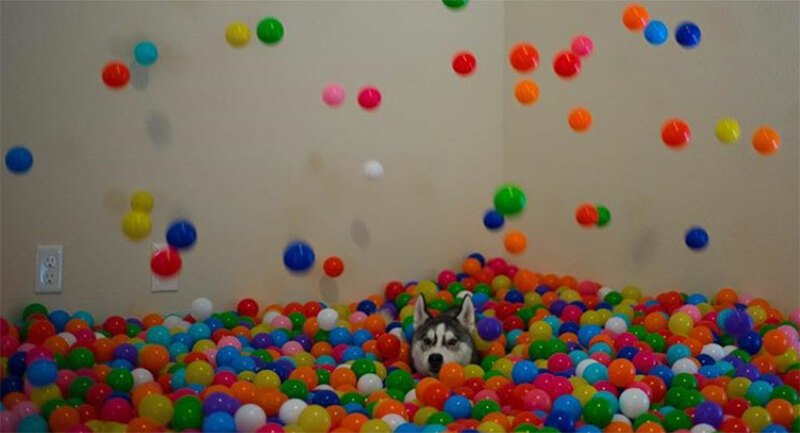 The dog’s name is Tetra, it’s a Siberian husky, and it’s so elated when its owner unveils the ball pit that you can feel it through your computer screen. The balls came from a local Toys R Us that was going out of business as the chain enters bankruptcy. Ball pit balls were selling in packs of 200 for $2 – or a penny a ball – so penguinz0 decided to just clean them out, going home with 5400 of the things. From there, he picked a hallway in his house, blocked the exits and dumped all of the balls to make a massive play zone for his hound. Here’s a video. We’re not sure how long this guy is going to let his hallway be a ball pit, but it doesn’t look like Tetra is going to give up her new play area anytime soon. What do you think? Do you love your dog enough to do this for them?